Dribbling the ball and aiming for nothing but net! 15-year-old Bryauna enjoys hitting the court for a variety of reasons. DETROIT (WXYZ) — Dribbling the ball and aiming for nothing but net! 15-year-old Bryauna enjoys hitting the court for a variety of reasons. “I like to play basketball. When I’m frustrated or have a lot on my mind, playing basketball helps me relieve some of that stress,” said Bryauna, who is in foster care in Michigan and is hoping to be adopted one day. “I like to go to the mall. I like Nike, love pink, Jordans, and I like food. My favorite food is chicken,” she said. Some of her other favorite things include listing to music and watching movies – particularly comedies. She has a number of goals for her future. “I want to be a business woman, but I want to do something in the medical field. I also want to open up a home for kids who are in foster care and don’t have anywhere to go,” she explained. “I also want to be a cosmetologist. I like to do hair. As you can see, my hair is cute,” Bryauna smiled as she held some of her long, side-swept curls. “I’ve got a great personality,” she laughed. Bryauna is a very good student who has been on her school’s honor roll. English is her favorite subject. She also has a strong faith. “I love church because I like to learn about God. But I feel like every time I’m having a problem, that’s where I go to – God. I pray,”she said. “I would like to go to church with a family. I would like to spend time with my family,” Bryauna added. Her worker said Bryauna would do best with a single mother who is experienced. She would also like to maintain her sibling relationships. But she really looks forward to bonding with her future parent or parents. “I would like to just be able to talk to them if I need to if something’s bothering me. Family is important to me,” she said. “I don’t really have a preference in what kind of family I want. I just want somebody who’s going to understand me and just want me for me,” she explained. “Hope is important, and hope to me means faith. My faith is in God, and I feel like with me having faith in God, that’s going to lead me to do better things in life and become better,” said Bryauna. 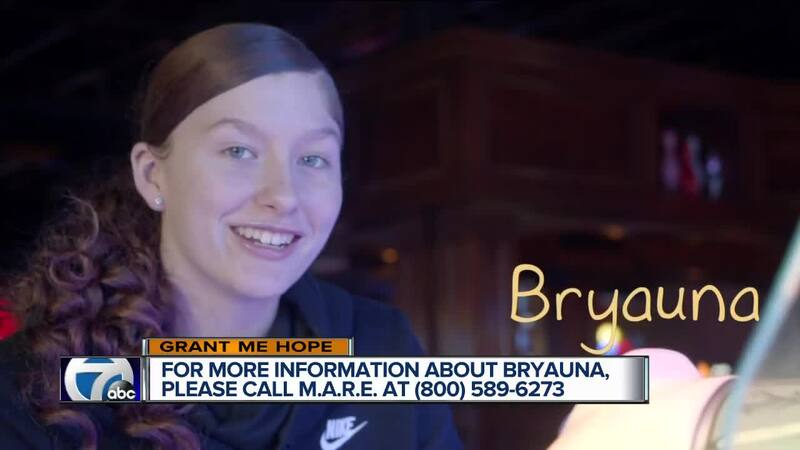 If you’d like to learn more about Bryauna, click here. If you’d like to talk with an Adoption Navigator with the Michigan Adoption Resource Exchange , please call (800)589-6273. Not able to adopt but want to help? You can show your support by sharing this Grant Me Hope video on social media. Thank you!